The goal of this Handbook on UCITS is to provide a one-stop source for investors and asset managers, service providers, students, researchers, and practitioners to learn the necessary knowledge and analytical skills they need when setting up, managing and monitoring a UCITS fund. 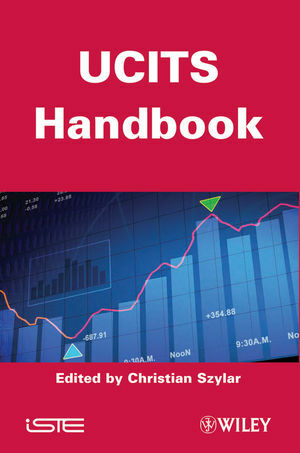 This handbook intends to introduce systematically recent developments in different areas of UCITS through a multi-disciplinary approach. The coverage is broad and thorough with a balance of theory and applications. Each chapter covering a special aspect of UCITS is edited by leading experts and practitioners in the area and covers state-of-the-art methods and theory of the selected topic. The purpose of this UCITS handbook is to provide, in a clear format, a summary of the main aspects of each discipline that UCITS involves. 1. Setting up a UCITS Fund, Jerome Wigny and Celine Wilmet. 2. UCITS Management Companies, Jerome Wigny and Celine Wilmet. 3. Risk Management in the Context of UCITS IV, Thierry López and Benjamin Gauthier. Management for UCITS funds, Romain Berry. 5. UCITS – The Investment Limits, Andrew P. White. 6. UCITS Distribution, Mark Evans. 7. The UCITS Management Company and Delegation, Killian Buckley and Ciara O’Sullivan. 8. UCITS Taxation, Andre Pesch. 9. Alternative UCITS, Christian Szylar. Christian Szylar is currently Global Head of Risk and Performance Measurement in a global leading asset management company Marshall Wace LLP, London, UK.